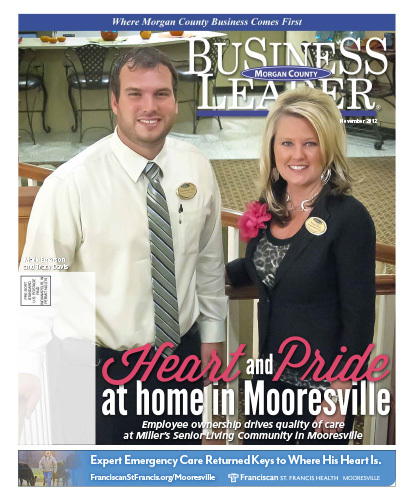 Morgan County residents may know that Miller’s Merry Manor has been in Mooresville for the last 30 years, but they may be surprised to learn a few things about the business. In 1964, Wallace and Connie Miller purchased a former County Home. Their original vision was to provide long-term healthcare for the aging. That vision blossomed and in 1982, the Millers purchased the Country Nursing Home in Mooresville renaming it Miller’s Merry Manor. Then in 2005, the organization created Miller’s Senior Living Community with the addition of another building with 49 independent and assisted living apartments. “It goes both ways,” adds Executive Director Mark Emerson. “It’s good for our residents to have people in and out of the building, but also, we like to bring people into our facility to showcase what we can do. “We feel like we are a part of the neighborhood and we are here to provide solutions to the elderly and their families. We have been a part of the community for 30 years and we take pride in being in Morgan County. Download the full November 2012 Edition here.